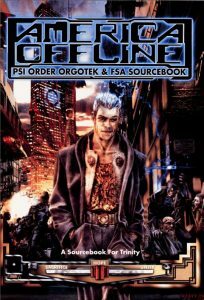 Today we take a peek at Oversight, the opening fiction from America Offline: Psi Order Orgotek & FSA Sourcebook for Trinity’s 1st edition. Greetings from your friends at Sierras Management Corporation! Each year we like to have special events for our friends in the Central Security Agency. This year we have brand new climbing and gliding systems to display! We’ve selected your names at random from the list of guests. Please respond if you’d like to be the first to use our new systems. Fortier and Whitbloom accepted the invitation within the hour. Leslie Contarkis didn’t. Since Bengali went through the guest list looking for agoraphobic guests, he wasn’t surprised. Now he’d have some time alone with the potential defectors. For a half-hour, he did exactly what SiMag expected him to. The “lucky winners” found the biotech ascenders startling at first, then they grew delighted with the sensation of going hand-over-hand up sheer rock faces. Fortier wanted to know technicalities, so Bengali described how the cords’ surface membranes turned them into something like conveyer belts, and how the skin-conductivity response systems tightened or released knots in response to climber panic. All three of them stood on top of Half Dome and admired the view of the valley. Bengali cleared his throat and decided it was time. “You’re both here because you contacted the Æon Trinity about defecting from the Central Security Agency,” he stated bluntly. He left them tense and nervous for a moment as they wondered if Bengali was himself a CSA spy set to catch them. Then he added the authentication codes. They relaxed… a little. Fortier answered first. “I didn’t bring data with me. I’ve got a repository I can get to, or have someone else access later.” Whitbloom nodded. Better prepared than many defectors, Bengali thought. He couldn’t guess how many cases had gone awry because the defector wanted to bring all sorts of obvious and suspicious gadgetry. Still, they hadn’t ever reached the tough part yet. Now was not the time to relax. “Okay, if you’re going, let’s harness up.” As he helped Whitbloom and Fortier into the Aerowing glider rigs, Bengali couldn’t resist indulging his curiosity so he concentrated his psionic awareness on each. Whitbloom’s noetic aura blended with the surrounding environment, but Fortier’s gave a brief, mild flare. Hmm; might be a weak latent, Bengali thought. Worth checking out once we’re home. Bengali focused on giving some quick guidance on the flying rigs’ operation. Within minutes, the trio launched into the sky and the ground lines reeled out smoothly behind the rigs. The two defectors followed Bengali and Whitbloom experimented with a few moves along the way. “Okay, here’s the tricky part,” Bengali said when they reached 5,000 meters. “We have a very narrow window of opportunity. I’ll switch on a comm jammer down below. Then we cut loose the ground cables, notch the gliders to full transparency and all head fast for Hetch Hetchy. That’s 30 kilometers northwest. I programmed it into the rig’s guidance chips, just in case. 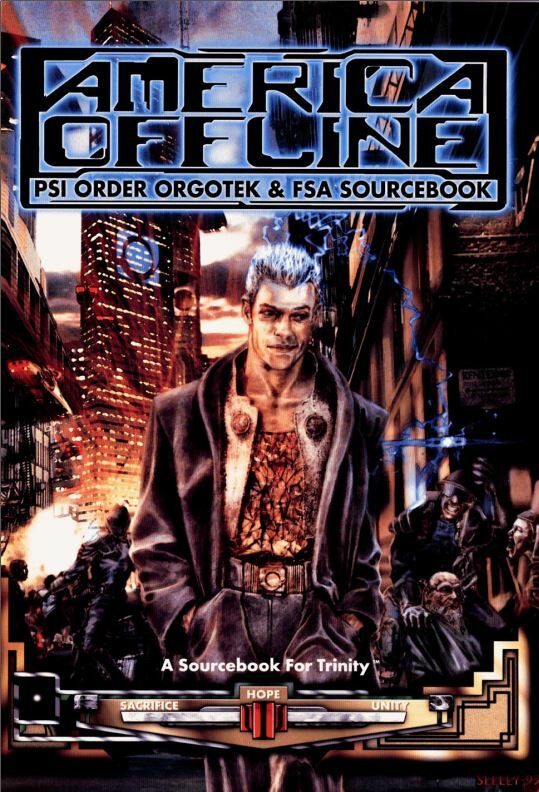 See how the rest of the rescue goes (you know the answer is not “smoothly”) in America Offline: Psi Order Orgotek & FSA Sourcebook, a sourcebook covering Orgotek, the Federated States of America, and electrokinesis. America Offline is available in PDF from DriveThruRPG. ◀ Now Available: Awakening Tarot in print, plus Requiem Bloodline shirts! I know what you mean, Saul. I still have all my 1st Ed trinity books including the Special Edition corebook that the Trinity sticker covering the original Aeon emblazoned on it (I removed that sticker as soon as I got that book home). Yeah, I can’t wait to see what they do with this new edition as well.